I've had a full plate this month trying to get my many projects done in time for Christmas. There is the amigurumi zombie I finished for my brother, the amigurumi Lego minifigure for The Boy (still in progress), the lap afghan for The Girl (also still in progress - the boy's afghans are already finished), the elf-style hat for my best friend, the various flannel pillowcases, and the Santa gift bags that haven't been started but need to get done in time for Christmas eve so Santa can wrap the "Pickles'" presents. My latest Christmas project is the Box Pouch. I stumbled upon a tutorial several weeks ago while browsing through various blogs. I made them from remnants I found in the fabric store. Each remnant could be used to make several box pouches depending on whether you chose a different fabric for the lining or not. In fact, one remnant was only about 0.6 yards and I was able to cut out enough fabric for the outer shell of 3 box pouches and still had plenty left over for another project idea (yes...ANOTHER project idea...). This was really a quick and easy project. 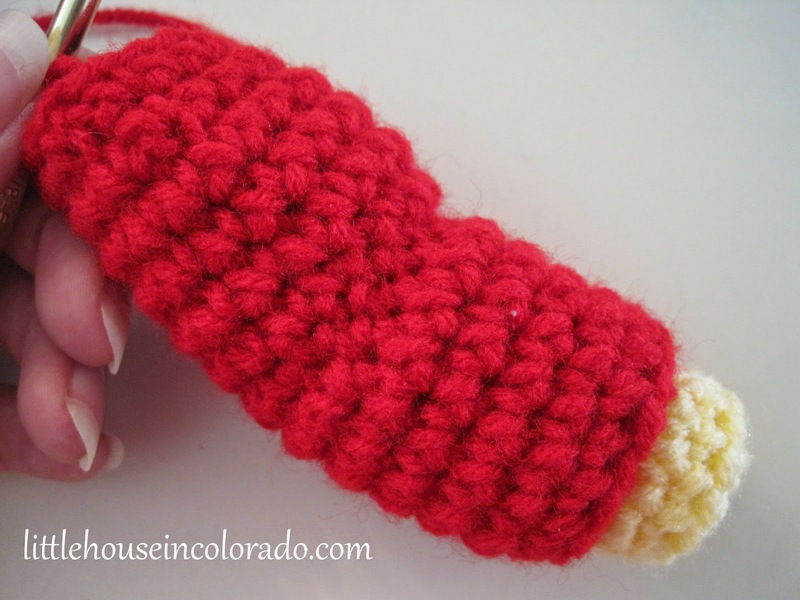 I'm thinking of modifying the pattern a bit...maybe adding a small handle, lengthening it some, etc. I also don't like all the rough seams. I might have to un-pack my serger if I keep making these. Still...I really like this little box. I have a few more to make and I'll keep one for myself for storing notions and such. 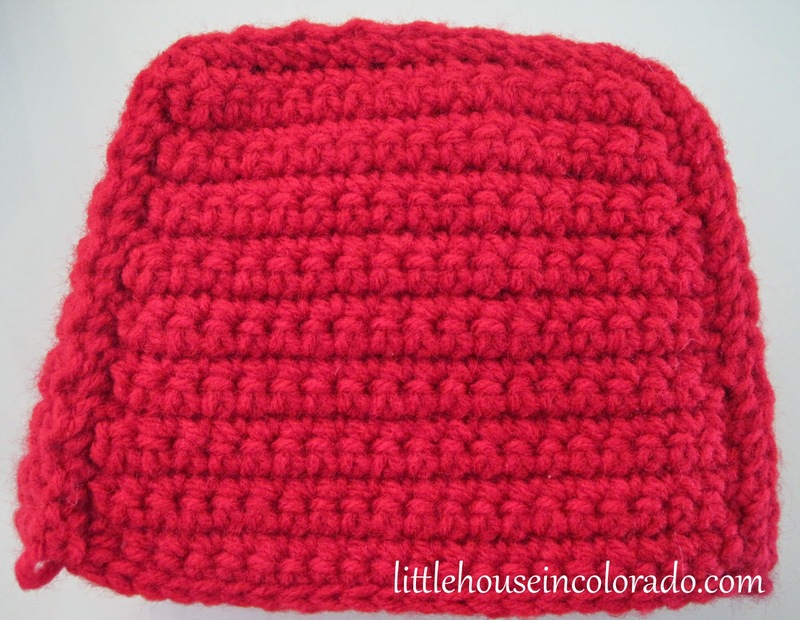 A slightly longer one would be great for a crochet travel bag! I decided to use safety eyes in the arms as joints - though I used really big ones since I have had the smaller ones come out through the stitches after rough play. 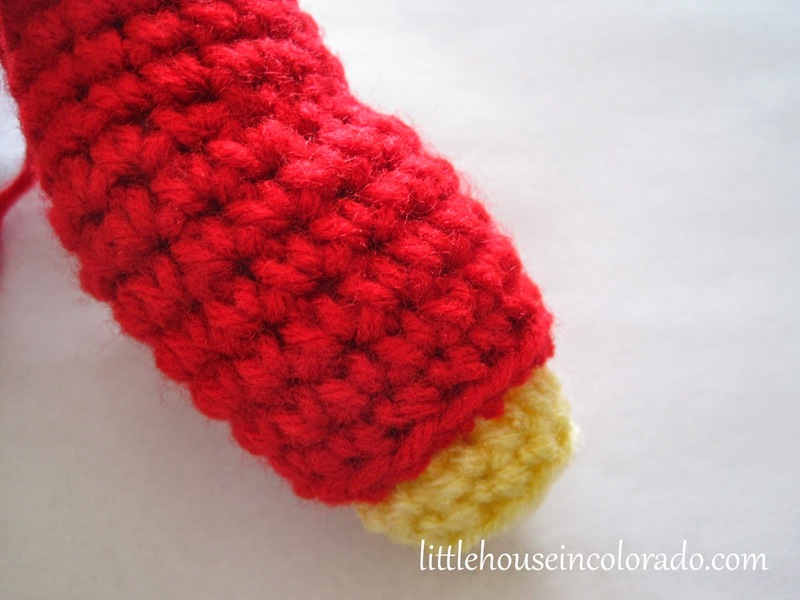 Earlier last week, my sister-in-law shared a link to a great pillowcase tutorial. Of course, I checked out (and bookmarked) the tutorial knowing full well I wanted to come back to it sooner rather than later. Though I didn't expect it to be so soon. This project was fresh in my mind when I received a sale email from Jo-Ann advertising $1.49/yard flannel on Black Friday. I didn't get too crazy matching fabrics. In fact, I think I was rather conservative. As I get the hang of this I might try some different combinations. I bought enough flannel to make 8 pillowcases (then I had to be patient and WASH them all before I got started - my LEAST favorite part of sewing anything). I didn't figure in for shrinkage and fraying during washing and flannel does both - badly. 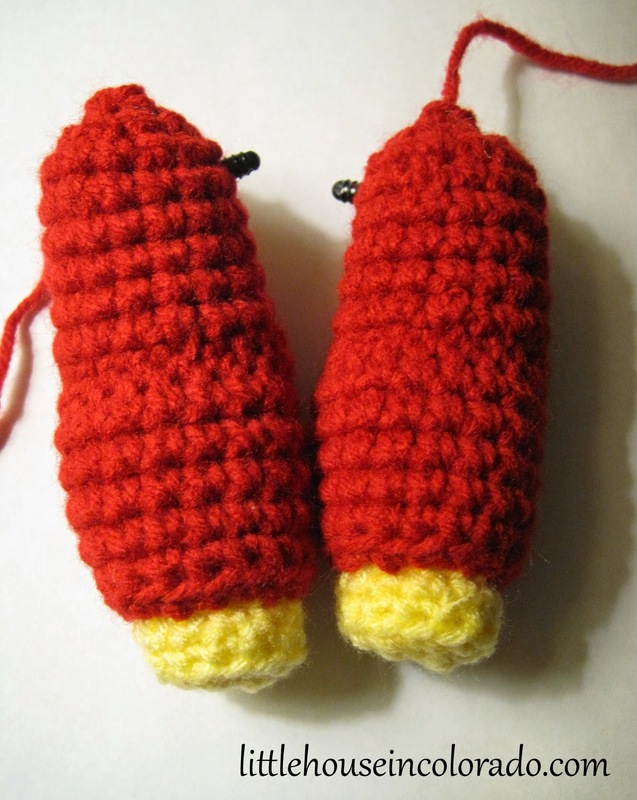 I am glad I washed them before making them though because if I hadn't, the finished product would have wound up skewed after the first wash. I still wound up with enough fabric to make 7 pillowcases, though. Yesterday, Mr. LH had a meeting with a potential client in the Northfield Stapleton Shopping Center so he asked if I thought the "Pickles" and I would like to browse through Bass Pro Shop or other stores while he was at his meeting. We're not usually on the north side of town so I agreed to go. I figured if they got tired of looking at the tank full of huge fish and the many stuffed animals they have throughout the store, we could always move next door to Target to browse the toy aisles. As soon as we walked in to Bass Pro Shop, I realized they had already opened their Santa Land. And The Boy waited in line for the cross bow darts. The Boy moved on to the rifles (I think they were laser rifles). The Girl and I started up a game of checkers but needed to finish up quick because being next to the popcorn stand was making us hungry! We decided to head on over to the fish tanks. Then we toured more of the store. and even found a gift for Mr. LH (we had to quickly purchase it and have it gift wrapped so he couldn't see what it was when he came back). I Made My Own Laundry Detergent! I've seen and heard about homemade laundry detergent before but I was never inspired to try it. I don't know why. Maybe because I just didn't trust it to do the job. In fact, when I mentioned it to my best friend I received a flat "why?" reply...like it was the most ludicrous thing she had ever heard. Well, Mr. LH and I had always used a pretty cheap brand of detergent until a few years ago when we started using Gain constantly. The Gain was much more superior to the cheaper brands when it came to getting out stains. But, Gain is not cheap and laundry for five people (though now whittled down to four with Elder Boy off on his own) was pretty expensive. I needed to find an alternative. About a month ago, I ran across a recipe for homemade liquid laundry detergent. It had great reviews - mostly from people who had been using a homemade detergent for several years. But, I thought, these are all moms and moms know what types of stains they have to deal with pretty regularly. If they say it's good, I'll try it. I have to admit, I was pretty skeptical. But with one 60 load batch (approximately) costing just under $2, I decided to try it. Mr. LH was surprisingly excited about it (though he, too, liked the Gain detergent). The laundry detergent recipe came from justapinch.com. I was able to find everything I needed in the grocery store (I used Fels-Naptha laundry soap instead of Zote Soap). I also got a cheap brand of detergent in a bottle to use (I planned to use the empty bottle to dispense my homemade detergent). Grate the bar soap until you have 1/2 cup of each. This was approximately 1/2 a bar of Ivory soap and 1/3 bar of Fels-Naptha soap. Place the soaps, borax and Arm & Hammer Super Washing Soda into 4 cups water and heat over medium heat stirring constantly until everything is dissolved (the Fels-Naptha soap took the longest to dissolve and the mixture was almost boiling by the time it did dissolve). Pour 8 cups hot tap water into a large bucket (preferably a clean 2 gallon bucket with a lid that you can find in the paint department at a hardware store). Add the soap mixture to the bucket and stir. Uncover, stir and discard any solid soap bits that might have floated to the top. Use 1/2 cup per laundry load. It's that time of year again! The weekend after Thanksgiving means it's time to pull out the Christmas Tree and all the ornaments! We put up the tree and added the lights yesterday and the holiday wreaths were hung on the front windows earlier in the day. We were ready to finish up and decorate the tree! We make or buy an ornament every year. It's really nice to unpack each of them and remember how we acquired it - even if the story is nothing but a memory of all of us surrounding an ornament kiosk at the mall choosing "the perfect one" (which is the story of last year's "Colorado Style" ornament). The new one this year is a gold plated aspen leaf (a real leaf) that we got in Georgetown, CO on one of our trips through there. The aspen trees are so beautiful here! It seemed fitting for us to have an aspen leaf be a part of our Christmas tree. There is even a glass ornament that Mr. LH made back when he was in 5th grade! With such a strange collection of ornaments, our tree winds up looking pretty old-fashioned, but I wouldn't have it any other way. In fact, the matching store-bought glass ball ornaments usually wind up staying in their boxes, never making it to the tree. The "Pickles" did a great job and Mr. LH topped the tree with our familiar angel. All we need now is to make a popcorn garland but we never do - we'd wind up eating more popcorn than we would string. With the main tree done, we moved on to the miniature tree. For years, my best friend and I gave each child a miniature ornament from Hallmark. We have quite a collection of Hallmark miniatures and other teeny ornaments now and they wouldn't all fit on our usual mini tree. In fact, last year, we had to leave half of the mini ornaments off the tree! So this year, we left the 12 inch tree in the storage box and had a bigger tree ready to decorate instead - about 2 feet high. We placed it on the window shelf by the front windows. It's the biggest shopping day of the year, though you'd be hard pressed to find me out and about with half the population losing all sense of manners and putting myself in danger of sustaining bodily harm just to save a few bucks. Although, the sales sometimes make us venture out hours after the first (and second and third and fourth) rush of shopping madness has past. For instance, last year on Black Friday Mr. LH and I bought a TV. We weren't in line at midnight to get the $300 off mega-deal, but we did get a nice one later that night for about $100 off retail (and we didn't have to fight any crowds). Earlier that day, we headed over to the Lego Outlet with the kids at Colorado Mills Mall. The mall was crowded, but not horribly so. This year we hadn't planned on going anywhere. The Girl had a birthday party to go to that evening but for the rest of the day, we were in our pajamas just kind of enjoying each doing our own thing but still being together. Does that make sense at all? The one activity we did together was to put up our Christmas tree - just as far as the lights. The decorating will come later. After we ate our dinner of leftover turkey with all the fixings, we got ready to take The Girl to Skate City for the birthday party. Then I got the brilliant idea (well, I thought it was brilliant) to go to the fabric store while she was at the party. They were having their Black Friday sale with $1.49/yard flannel, I had a 20% off coupon AND I had Christmas presents to make. So after dropping The Girl off, that's where we headed. Mr. LH and The Boy wandered around, looked through cake and candy books to find recipes for me and were otherwise thoroughly bored (though The Boy also found a great pirate print that I'll have to pick up at a later date). But they were good sports. It got a bit ridiculous when I had to wait in line to get my fabric cut (45 minute wait) and I was getting antsy because we still had to pick The Girl up but eventually it was my turn. Santa gift pouches. Santa presents have always (and I mean ALWAYS) been wrapped in plain gold wrapping paper. It hasn't been a problem except now PLAIN gold paper (without the embossed patterns or prints) is becoming increasingly hard for Santa to find. So this year "he" is going eco. Santa presents will now be presented in a fine Santa sack in red corduroy with a white "fur" trim (all machine washable) and closed with a gold drawstring cord (pictured on the very top of the pile). Now hopefully I'll have them ready in time for Santa to use them. I'm still brainstorming how I'll do the tags every year. The next 7 fabrics in the pile are for 4 sets of flannel pillowcases. I got the idea from from sister-in-law who shared a link to a pillowcase tutorial on her blog. I'll make the cotton ones another time but the flannel is what was on sale :). The final 4 fabrics (pictured at the top of the pile) are to make several Box Pouches I found while trolling through random blogs one day. They are practical, look great, seem easy to make and you need so little fabric that I just selected some prints from the remnant pile at the store. Sooo...add those projects to my already large list of others. I will definitely not have time to be bored this holiday season! Can you believe that on a huge holiday like Thanksgiving I didn't take a single picture of PEOPLE? It's true! I wound up with pictures of practically every dish I made but didn't take one. single. picture. of my family...sheesh! Well, I was too busy enjoying them. It seemed a shame to put everyone through the "poses" for pictures (and we didn't need a single family photo for a Christmas card this year. The cards were ordered a week prior). Last year, I wrote out a list of things I was thankful for and I decided to do it again this year. There are so many things I am thankful for. Some seem trivial but are still so important in the everyday scheme of things. For instance, I am thankful that the lady at the fabric store checkout had a great smile for everyone even though the day had been long and stressful (it was Black Friday). I am thankful the turkey was thawed in time. I am thankful Elder Boy was able to make it home to spend the holiday with us. I am thankful all the food turned out wonderfully (that makes TWO successful Thanksgiving dinners without outside help). I am thankful I had nutmeg available when the neighbor's daughter came to ask to borrow some. I am thankful my online business, while still going slowly, is still "in business". I am thankful that Mr. LH, even though his hours are sometimes long and stressful, continues to thoroughly enjoy his position at the college. I am thankful my brother was able to spend the holiday with my dad in Tennessee and that Mr. LH's parents were able to spend it with my brother-in-law and his wife in Florida. There were years we could all be together and I am thankful for those years we had. I am thankful the house sold earlier this month (thankful for that for so many reasons). As I am every year, I am so very thankful for my wonderful husband, a man with infinite patience and an amazing tolerance for my many "projects". I am thankful for my children, all healthy, happy - full of spontaneity and innocence and awe that reminds me day to day to "look at the world through the eyes of a child". I am thankful my children still believe in the magic of Santa Claus (at least two of them still do). With the "Pickles" back in school, and the Ami-Zombie completed, I was able to get back to the Lego Mini-figure. This time, I started working on the body. I decided to make it in three parts - a front, a back and the side (as one piece). The bottom would be left open so I could easily stuff it, add joints to the arms and then attach it to the base. The mini-figure body is just 20 stiches across at the bottom and 16 across at the top. I made the side piece 10 stitches wide and it runs along 3 sides. I'm still taking plenty of notes as I go along. I'm hoping to be able to create a pattern with the notes, then attempt to make a second mini-figure from the pattern (to test the pattern instructions) before I share it. The Girl's entire 3rd grade has been reading Judy Moody. It's kind of their "theme" for the year. The teachers read Judy Moody books to the students. They do activities that Judy Moody does in the books (like a "Me" collage they did at the beginning of the year to introduce themselves to their classmates). When they do well in class (behavior and achievements), they earn "Judy Moody Bucks" that they can spend in their school store. It might do me some good to read some Judy Moody books to see what they're up to in class. Throughout the past week, the 3rd grade teachers each became a character from the Judy Moody books and campaigned for the chance to be chosen as 3rd grade class president. The Girl's teacher was "Stink". Today, the 3rd grade class was having their election. I have a feeling the students will each choose their own teachers. The students were encouraged to dress up as their favorite Judy Moody character as well. The Girl chose to be "Mouse", Judy Moody's cat. Thank heavens "Mouse" was a black cat. I didn't have to think too hard about how to make the accessories to fill out her costume. Back in 2006, I made The Girl a black cat costume for Halloween. It was made from a black sweatshirt and sweatpants that I trimmed in fake white fur. I attached a tail to the shirt (I didn't want its weight pulling down her pants) and wrapped a headband with ears made of fleece. Halloween 2006 - You can see the rear of the cat costume here. The tail is attached just above the shirt hem. The black cat costume was by far my favorite of all her Halloween costumes. Four years later, we still had the costume packed away in the basement but of course, the shirt and pants no longer fit. The ears, however, still did. The Girl planned to wear all black to school with her cat ears and some whiskers drawn on her face. We also decided that she still needed a tail. Luckily, I had a hefty amount of black fleece packed away so I quickly fashioned a long tail out of it and stuffed it with poly-fill. I created a strap at the top of the tail that would wrap around the belt loops of her pants and Velcro to itself holding it in place. Too bad the Velcro as well as the sewing thread that I had on hand was white. Who doesn't keep black thread on hand??? Apparently I don't. Within 30 minutes, We had all the pieces and parts for a cat costume. And The Girl can continue to use the headband cat ears and new tail for many more future costumed events! She was quite happy with her costume when she put it on this morning. In fact, she bounded out of bed bright and early just to put it on. 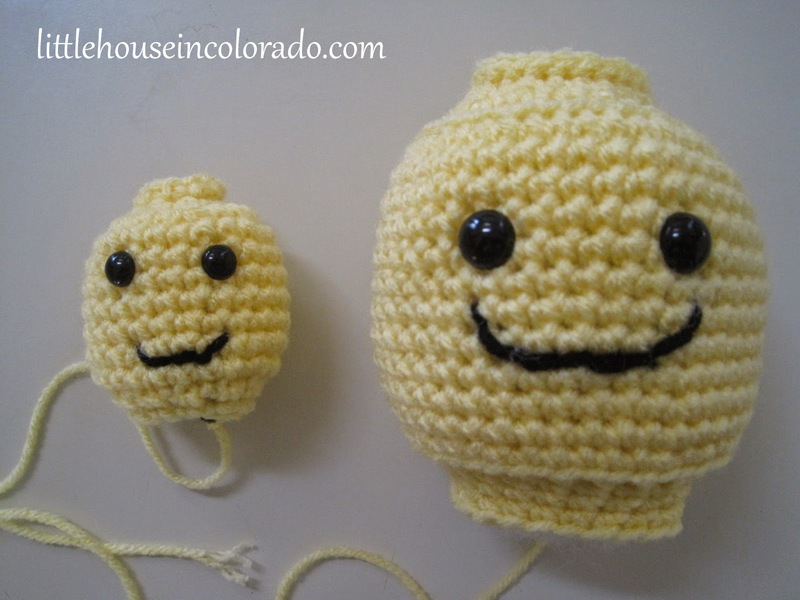 After the "Pickles" went to bed last night, I was able to start back on The Boy's amigurumi Lego Mini-figure. At least on the head. I knew I would want it bigger than the prototype head and I had thought about it all weekend while I worked on the Ami Zombie. So being the impatient person I was, I skipped over the rest of the prototype pieces and parts to work on an improved Lego mini-figure head. I had to pull it apart several times but was finally able to get a shape resembling what I had in mind. The head is about 5 inches across - still larger than I had originally planned, but I'm going with it. Thank heavens I've been taking notes the whole time - just in case I want to re-create it. I have finally finished the "Plants vs. Zombies" Ami-Zombie for my brother! He looks a bit beefier (and less "dorky") than the original one I made for The Boy, but he still has that glazed look. I just need to make his cone hat and then he'll be ready to send off! 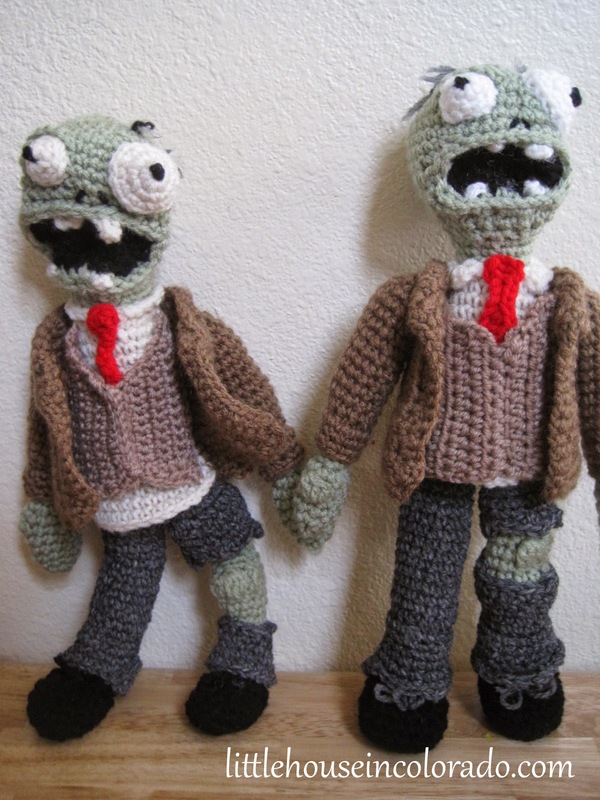 The original ami-zombie is on the left. The new one is on the right. As mentioned in an earlier post, I recently won a copy of the Prairie Home Cooking Cookbook. As soon as I received it, I started reading it. In fact, the cookbook was my nightly reading for several of the following evenings. One of the first recipes I knew I had to try was Gingerbread Waffles with Pear Sauce (page 19). The recipe itself sounds wonderful, but waffles and pears are two things my son absolutely loves! The Boy is our "waffle kid". He's the only person I know that actually orders a waffle at the Waffle House (Mr. LH used to take the kids there after scout camp outs). He used to have pancakes every Saturday morning but his love of waffles resulted in him receiving a waffle iron for his birthday about three years ago. Strange, I know. But he absolutely loved it. And now he gets a choice of waffles OR pancakes every weekend. I guess when he moves out Mr. LH and I will have to get ourselves a new waffle iron - or just get him a new one. The Boy also adores pears. He will take a ripe pear over an apple any day. The Girl gets peaches in her lunchbox, The Boy get pears. The Girl wants an apple for her snack, The Boy wants a pear. The recipe sounded perfect though the "Pickles" opted to not have the pear sauce because they didn't want to give up their precious stash of pears that had been slowly ripening in the bottom of the refrigerator. So we just went with the Gingerbread Waffles. The recipe was very simple to make. The Girl helped me measure out the ingredients and laughed when the packed brown sugar came out in the shape of the measuring cup. We have been slowly making our way through the Little House books lately so she remembered how Laura and Mary would eat their bread with molasses. When we measured out the molassas, she decided she wanted to try some (she didn't like it). Then she insisted on helping me stir. The "Pickles" marveled at how high the waffles were rising in the waffle iron. The batter seemed a bit thick to me, so I thinned it with more milk (I wound up adding about 1/4 cup more milk to the remaining batter making me wonder if I had mis-measured the flour in the first place). Time To Make The (Homemade) Doughnuts!